Injuries can ruin your life, make you gain weight, become depressed or simply force you to live in constant pain. There are 2 types of pain: chronic and acute. Our personal training team has a surplus of knowledge in handling acute injuries and aiding in a quick recovery. We never lose sight of your fragile state, making sure not re-damage or cause compensating injuries. If your problems have been on-going despite your patient efforts, many times another issue (i.e. postural imbalance) is in fact needing addressed and corrected. Crucial things so small, such as keeping a wallet in the back pocket, when daily can create pinched nerves and worse... This is what we do. OC Private Training will bring you back to a PAIN-FREE lifestyle. Aren't you missing out on Fun? on your life? 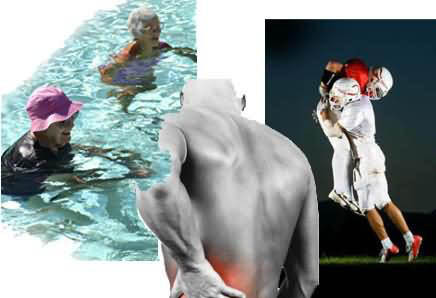 We use only personal trainers with extensive training in post-therapy, and sports injury situations. Our program has been doctor approved to minimize low back pains for issues of weakness, disk herniation/bulges, vertebral issues along with simple tightness from the daily grind of work. We use a combination of full body stretches designed to manipulate your nervous system to self-activate itself into a relaxed (non-tensed) state. This style has been proven to create a new pain-free posture and train the body to maintain it.